The objective of the European Microfinance Award 2008, 'Socially Responsible Microfinance' was to highlight and stimulate microfinance initiatives that represented breakthroughs in promoting social performance in microfinance. 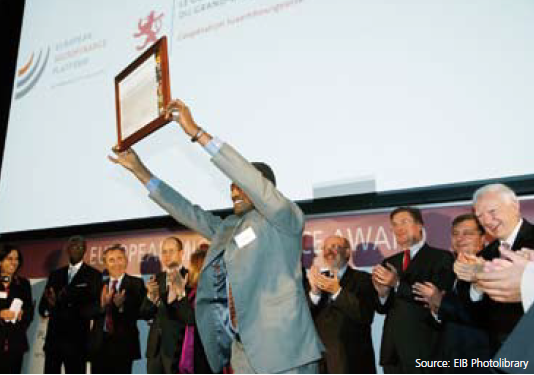 On the 12th November 2008 during the Award ceremony at the European Investment Bank, in the presence of Her Royal Highness The Grand Duchess of Luxembourg, the winner was announced and the prize was given to the microfinance institution Buusaa Gonofaa, represented by its Director, Mr. Teshome Y. Dayesso for the development of an innovative system for determining customer needs and evaluating changes in their social well-being. The President of the High Jury, Ms. Carmen Velasco, also presented certificates to the two other finalists; AMK-Angkor Microfinance Kampuchea of Cambodia and RFR- Red Financiera Rural of Ecuador.